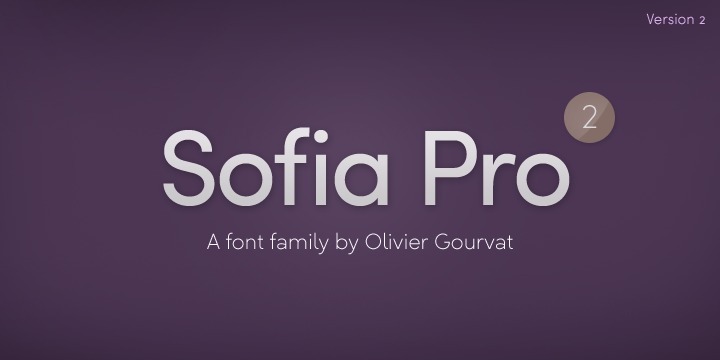 Sofia Pro is a new version, improved typeface created by Olivier Gourvat and published by Mostardesign which it caomes in 8 weights matching italics, various OpenType Features, multilingual support and over 500 glyphs. This sans modern font has geometric proportion, low contrast, small caps etc and it can be use for fashion magazine, business book, package design, poster, display, logo, branding and so on. You might want to check Sofia Pro Condensed family for a wide variety of situations. Price: starting from $25 for one font to $299 for all 16 fonts. A font description published on Friday, August 28th, 2015 in Fonts, Mostardesign, Olivier Gourvat by Alexandra that has 4,944 views.